they took Stanford offensive tackle Jonathan Martin in the second round. They’ll need to coach up University of Miami defensive end Olivier Vernon, whose college production doesn’t exactly match his third-round selection. They took tight end Michael Egnew, a 6-5 former high jumper and basketball player, in search of another player who can go up over defenders. The Dolphins picked up an extra draft pick when they traded out of the No. 73 spot back to the No. 78 spot held by San Diego and picked up a sixth-round pick from the Chargers in the process. Though Martin couldn’t say what career he would be headed for if not for football — “I haven’t really thought about that. My goal all along has been to get to the NFL.” — he doesn’t break the Stanford mold of actual student-athletes. Martin majored in “Classics,” as in ancient Greek and Roman history. Martin’s maternal great-grandfather graduated from Harvard in 1924. Robert Griffin III and His Latin Teacher ~ ICWUDT!! ZENIT: When did research begin on St. Philip’s tomb in Hierapolis? D’Andria: In 1957, thanks to professor Paolo Verzone, who taught engineering at Turin’s Polytechnic and was very passionate about archaeological research. An agreement was stipulated between the Italian and Turkish Republics, which enabled our team of archaeologists to carry out searches in Hierapolis. Professor Verzone was the first director of that mission. He began immediately, of course, to look for the Apostle Philip’s tomb. He concentrated the excavations on a monument that was already visible in part and known as the church of St. Philip, and he discovered an extraordinary octagonal church, a genuine masterpiece of Byzantine architecture of the fifth century, with wonderful arches in travertine stone. All this complex of constructions made with so much care and detail made one think that it was a great church of pilgrimage, a very important shrine, and Professor Verzone identified it as the Martyrion, namely the martyrial church of St. Philip. And therefore he thought that it was built on the saint’s tomb. Hence he had several excavations carried out in the area of the main altar, but he never found anything that made one think of a tomb. I myself thought the tomb was in the area of the church, but in 2000, when I became director of the Italian archaeological mission of Hierapolis, by concession of the Ministry of Culture of Turkey, I changed my opinion. D’Andria: All the excavations carried out over so many years had no result. I also carried out research through geo-physical explorations, that is, special explorations of the subsoil, and not obtaining anything, I was convinced we had to look elsewhere, still in the same area but in another direction. ZENIT: And towards what did you direct your research? D’Andria: My collaborators and I studied a series of satellite photos of the area carefully, and the observations of a group of brave topographers of the CNR-IBAM, directed by Giuseppe Scardozzi, and we understood that the Martyrion, the octagonal church was the center of a large and well-developed devotional complex. We identified a great processional street that took the pilgrims of the city to the octagonal church, the Martyrion at the top of the hill, the remains of a bridge that enabled pilgrims to go across a valley through which a torrent flowed; we say that at the foot of the hill there were stairs in travertine stone, with wide ascending steps that led to the summit. At the bottom of the stairs we identified another octagonal building that could not be seen from the surface but only on satellite photos. We excavated around that building and realized it was a thermal complex. This was an enlightening discovery that made us understand that the whole hill was part of a course of pilgrimage with several stages. Continuing our excavations, we found another flight of steps that led directly to the Martyrion, and on the Square, next to the Martyrion, there was a fountain where pilgrims did their ablutions with water, and near there a small plain, in front of the Martyrion, where there were vestiges of buildings. Professor Verzone had not dared to carry out an excavation in that area because it was an immense heap of stones. In 2010, we began to do some cleaning and elements of extreme importance came to light. D’Andria: A marble architrave of a ciborium with a monogram on which the name Theodosius could be read. I thought it was the name of the emperor and so that architrave made it possible to date the martyrial church between the fourth and fifth centuries. Then, little by little we found vestiges of an apse. Excavating and cleaning the floor, a great church came to light. Whereas the floor of the Martyrion was octagonal, this floor was that of a basilica, with three naves. A stupendous church with marble capitals refined decorations, crosses, friezes, plant branches, stylized palms in the niches and a central pavement with marble tesserae with colored geometrical motifs: all referable to the fifth century, namely, the age of the other church, the Martyrion. However, at the center of this wonderful construction what enthused and moved us was something disconcerting that left us breathless. D’Andria: A typical Roman tomb that went back to the first century after Christ. In a certain sense, its presence could be justified by the fact that in that area, before Christians built the proto-Byzantine shrine, there was a Roman necropolis. However, examining its position carefully, we realized that that Roman tomb was at the center of the church. Hence, in the fifth century the church had been built precisely around that pagan Roman tomb, to protect it, because, evidently, that tomb was extremely important. And immediately we thought that perhaps that could be the tomb where the body of St. Philip was placed after his death. ZENIT: And did you find confirmations of this supposition? D’Andria: Indeed. In the summer of 2011, we carried out extensive excavation in the area of this church with the coordination of Piera Caggia, research archaeologist of the IBAM-CNR, and extraordinary elements emerged that confirmed are suppositions fully. The tomb was included in a structure in which there is a platform that is reached by a marble staircase. Pilgrims, entering in the narthex, went up to the higher part of the tomb, where there was a place for prayer and they went down on the opposite side. And we saw that the marble surface of the steps was completely consumed by the steps of thousands upon thousands of people. Hence, the tomb received an extraordinary tribute of veneration. On the façade of the tomb, near the entrance, there are nail holes which undoubtedly served to support an applied metallic locking device. Moreover, there are grooves in the pavement that make one think of an additional wooden door: all precautions that indicate that in that tomb there was an inestimable treasure, namely, the apostle’s body. And on the façade, on the walls there are numerous graffiti with crosses, which in some way have consecrated the pagan tomb. Excavating next to the tomb we found water baths for individual immersions, which undoubtedly served for healings. After venerating the tomb, sick pilgrims were submerged in the baths exactly as happens in Lourdes. However, the main — I would say mathematical — confirmation which attests, without a shadow of a doubt, that that construction is really St. Philip’s tomb comes from a small object that is in the Museum of Richmond in the United States. An object in which there are images that up to now could not be fully deciphered, whereas now they have an obvious significance. ZENIT: What object is it? D’Andria: it is a bronze seal about 10 centimeters (four inches) in diameter, which served to authenticate St. Philip’s bread to be distributed to pilgrims. 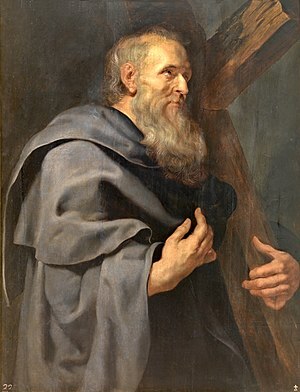 Icons have been found that represent St. Philip with a large loaf in his hand. And, to be distinguished from ordinary bread, this bread was marked with the seal so that pilgrims would know that it was a special bread, to be kept with devotion. There are images on the seal. There is the figure of a saint with a pilgrims’ cloak and an inscription that says “Saint Philip.” On the border is a phrase in Greek, an ancient phrase of praise to God: Agios o Theos, agios ischyros, agios athanatos, eleison imas (Holy God, strong Holy One, immortal Holy One, have mercy on us). All the specialists of Byzantine history who know that seal have always said that it came from Hierapolis. However, what is most extraordinary is the fact that the figure of the saint is presented between two buildings: the one on the left is covered by a cupola, and it is understood that it represents the octagonal Martyrion; the one on the right of the saint, has a roof like the one of the church of three naves which we have now discovered. The two buildings are at the top of a stairway. It seems that it was an image of the complex then existing around St. Philip’s tomb. A photograph made in the sixth century. Moreover, in the image of the seal there is an emblematic element: a lamp hanging at the entrance, typical signs that served to indicate a saint’s sepulcher. Hence, already indicated in that seal is that the tomb was in the basilica church and not in the Martyrion. ZENIT: You have made all these discoveries in recent times. D’Andria: I would say very recent times. We did so between 2010 and 2011. Above all 2011 was the year of the greatest emotions for us: we discovered the second church and Philip’s tomb. We concluded a work begun 55 years ago. The news has gone around the world. And it has attracted scholars and the curious to Hierapolis. Among others, at the end of last August, hundreds of Chinese arrived, as well as numerous Koreans and journalists of several nationalities. Last Nov. 24, I had the honor of presenting the discovery, at the Pontifical Archaeological Academy of Rome, to scholars and Vatican representatives. Also Bartholomew the patriarch of Constantinople, primate of the Orthodox Church, wished to receive me to know the details of the discovery, and on Nov. 14, feast of St. Philip in the Orthodox Church, he celebrated Mass precisely on the tomb found in Hierapolis. And I was present, 1,000 thousand years, the chants of the Greek liturgy resounded among the ruins of the church. In the forthcoming months, we will take up the works again and I am certain that other important surprises await us. Archaeology students got a taste of the real thing during a digging lesson, when they stumbled upon what was this week confirmed to be a Roman temple – in an area not previously thought to have been populated. Lecturers at Bonn University had set up a mock archaeological dig at a building site on campus to teach hopeful historians digging techniques. What they did not expect to find were the 2,000-year-old foundations of a building, nestled into the dense, clayish mud. While the initial discovery was made in March, it was only in the past fortnight that the team realised the foundations were from a temple from the Roman era, the floor of which was scattered with broken pottery dating as far back as 800 BC. The building, which could have been part of a wealthy country estate, was 6.75 metres wide and 7.5 metres long. It was probably made from wood or clay, but roof tiles and iron nails that matched other second century Roman buildings were fished out of the rubble. Only one similar temple – a room surrounded by an enclosed walkway – has been found in that part of North Rhine-Westphalia. Builders uncovered a larger version while constructing the Bonn World Congress Centre in 2006. Historians had previously thought that the only settlement in that area from the time was near the Rhine. But Dr Frank Rumscheid, archaeology professor at the university, said that the temple suggests people lived away from the lush river banks, in what is now the Poppelsdorf campus area, some kilometres back from the water. Work is set to continue on the dig site, but when the excavation is complete and everything worth inspecting has been taken to the university laboratories, the site will be filled in and building work will continue. “There’s not enough there to completely lift the foundations out and create a replica,” said Rumscheid. But he added that further archaeological investigation of the Poppelsdorf site could turn up more interesting finds. … check out Adrian Murdoch’s blog for links to German press coverage. The original press release is there with some photos which don’t seem to want to open up here at school.